Buying a greenhouse can be a daunting process, but the results are well worth it. We hope the following greenhouse buying guide helps you with your choice. Greenhouse growing is not just for the professional these days. With the high cost of food and the increased use of pesticides, backyard hobby organic growing is becoming increasingly popular. Are you a beginner, hobbyist or professional grower? This is probably the most important question. The answer to this question will help determine size, cost and complexity of assembly of your greenhouse. The number one regret of most beginners is they did not buy a bigger greenhouse. 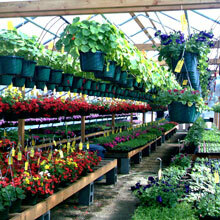 Once you add plants, greenhouse benches and garden accessories your greenhouse quickly becomes very crowded. As you become more advanced and successful, you will want to increase the volume of your growing space. Upgrading to a larger greenhouse can be more costly down the road. Professional growers may require much larger, durable structures and complex environmental controls to better extend their growing seasons and production. While building your own greenhouse can be rewarding, it may not always be more economical. Greenhouse plans may be inexpensive, but the materials needed for the construction can be expensive or hard to find. All our greenhouses include easy-to-follow instructions, great warranties and will save you money when compared to buying all materials individually. TekSupply's greenhouses are supported by a knowledgeable staff and dedicate customer service department  building your own greenhouse from greenhouse plans does not offer that security. Should you however choose to construct your own greenhouse, we do offer polycarbonate panels, greenhouse film, ground cover, shade cloth and a wide assortment of greenhouse accessories. You will need to consider your growing zone and your local weather. Factors such as snowfall, wind, rainfall and temperature may help you determine which greenhouse to select. High snow and wind regions may require a more structurally sound greenhouse such as our roll-form models. 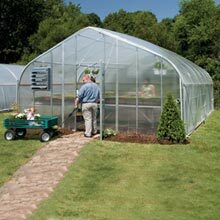 In areas with extreme heat, you may want to consider a greenhouse with increased ventilation such as roll-up and drop down curtains or shading options. Colder areas may require additional heat sources to extend the growing season. Year-round growing requires a more insulated, tightly sealed greenhouse. Seed germination or early season plantings do not always require the same integrity. Take some time to research the climate requirements for the plants you wish to grow. Heat-sensitive plants may require extra ventilation and shading. The success of your growing depends on how regulated you keep your greenhouse climate. Most plants have specific climate requirements and will die if they are not met. One of the biggest misconceptions is that a greenhouse will protect all your plants from the elements. You need to determine how hot or cold your region can get and make the necessary environmental changes using additional heaters, fans, shade cloth or vents. Keep in mind some of these accessories may require electricity or a fuel source such as propane or natural gas. Commercial greenhouses typically come in two different styles  gothic (house) and round (Quonset) style. Professional gothic and round style greenhouses tend to be built with functionality in mind and require more yearly maintenance than hobby greenhouses. These structures usually consist of frames covered with greenhouse film or polycarbonate panels. With increased usage and weather conditions, coverings may need to be replaced as needed. Cold frames (the basic frame structure) and various greenhouse coverings can also be purchased separately. Greenhouse frames can be constructed of aluminum, galvanized steel, real and synthetic woods and PVC. If you are looking for years of use from your greenhouse be sure to choose one that is made of materials that stand up to the elements. While wood might look more appealing, it may be more prone to rot and insect damage. If you choose a wood frame, make sure it is cedar or pressure-treated lumber. PVC may be more economical and lightweight but is not as structurally sound as the other materials and should not come into contact with greenhouse film. Aluminum or galvanized steel is a better choice for longevity and strength. 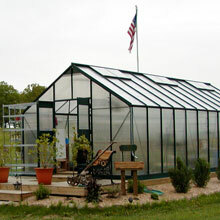 For the ultimate greenhouse frame, we recommend our S500 greenhouse models. Greenhouse coverings, or glazing, can consist of various millimeter poly films, polycarbonate, glass and shade material. Coverings play a key role in the retention of heat. Poly films and polycarbonate come in various thicknesses. The thicker the better! Some poly films use a double-layer construction with an air pocket for insulation. Polycarbonate panels can increase the cost of the greenhouse, but will last longer and offer more protection against wind and snow. Polycarbonate panels also come in various thicknesses and single or twin-wall construction. Glass can be the most attractive and is clear, but is also the most costly and least effective in retaining heat. To make your greenhouse purchase complete, you will need to consider some accessory options. As mentioned earlier, your local climate is a key factor in the type of accessories you will need. 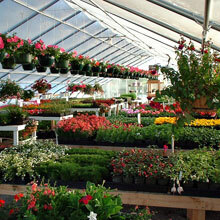 We offer a vast assortment of greenhouse accessories for all grower levels and greenhouse sizes. Listed below are some of the basic accessories you may need. Keep in mind, some accessories may require an electrical or fuel source so plan the placement of your greenhouse accordingly. Now that you have your new beautiful greenhouse you will need to fill it with your plants. Adding functional benches will help you make the most of your growing space and make watering a breeze. Benches come in many sizes and can be made of different materials like galvanized steel or aluminum. Hobby growers may also like to use a planting or work bench for potting and plant care. You can also fabricate your own greenhouse benches using common building supplies, but be sure to use materials that will not be affected by moisture. To make things even easier and more economical, we have created kits with all the accessories you need to start growing like a pro! These kits were specially created for use with all the different greenhouses we sell. Most contain a heat source, cooling/circulation system, benching, and watering accessories suited for the specific size greenhouse. TekSupply Commercial Greenhouse Kits are affordable, all-inclusive, greenhouse system packages that include a professional greenhouse along with all of the cooling and ventilation supplies required for a year-round, weather-resistant growing experience. 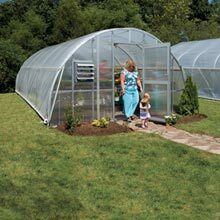 Purchasing a complete greenhouse system is truly one stop shopping.